We're not quantum physicists by any stretch of the imagination, but what we are is keen admirers of truly breathtaking science...especially when it recreates the same sort of racing you'd find in Sony's futuristic racer, Wipeout. Like any geek, understanding the science behind the phenomena is the very beginning. Much more interesting is taking its principles and applying it to real-life or indeed what we've seen on Star Trek. It's science that makes us re-evaluate exactly how we see the world around us, where our own understanding of gravity, mass, friction and the like are entirely rewritten. But, then again, those racers do look a little CGI-ish, which has begged the question by many Youtube commenters and the odd blog post alike: is this video real? Well, inquisitive reader, how do you get to the point where you could manipulate such an object without touching it, allowing it to move along a track in free space? There's plenty of scientific proof to suggest this is real; but the validity of the viral video is the point of concern. Allow us to help out there. 'Quantum levitation' or 'quantum trapping' is one such phenomena and allows high temperature superconductors (HTSC) – materials that have a superconducting transition temperature above −243.2°C - to literally becoming 'trapped' in mid-air above a magnetic field. The result is astounding. 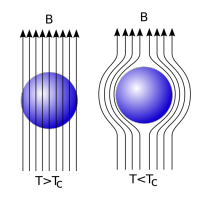 Quantum trapping is possible because superconductors expel all magnetic fields from inside, something called the 'Meissner Effect', better explained in the diagram (left). In the example's case however, the superconductor is so thin that the magnetic field penetrates in minute quantities called 'flux tubes' (right). Because these magnetic fluxes cause superconductivity to be locally destroyed, the superconductor will try and 'pin' the flux tubes in weakened areas. It is the pinning of the flux tubes which causes the object to float in mid-air. So nice and simple then. With the help of our 'gifted' insight as nerds with too much time on our hands, you too can recreate your favourite hover-car racing. F-Zero fans rejoice! In terms of the Wipeout video, our opinions are split between 'that's the smoke created by the liquid nitrogen naturally' and 'that smoke is too perfect to even be considered real.' We'll leave that bit up to you; but the means to make it happen for real are there for sure.